The calculators provided on this page help you identify problems and solutions, and as a result increase your organization's ability to compete. The Benefits Calculator breaks out the different types of benefits as part of an employee's total compensation by cost and percentage. 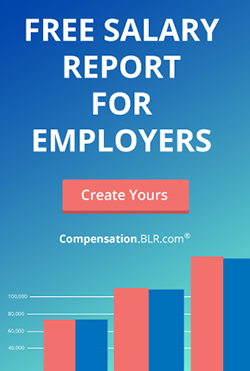 With this calculator you can use a mix of mandatory and/or voluntary types of benefits to compare the relationship of compensation to benefits. This information can be quite useful during the negotiation stage of the hiring process. Analyzing the mix of benefits helps managers see the big picture of an individual employee's compensation, including fixed costs such as salary and mandated benefits versus variable costs like medical, dental, and other voluntary benefits. Understanding the components can help managers develop strategies for reducing costs. "Compensation mix" is defined as all the components that make up total compensation expressed as a percentage of total compensation. Looking at the mix of compensation helps managers understand what drives total compensation including fixed costs such as salary versus variable costs such as overtime and benefits. Understanding the components can help managers develop strategies for reducing costs. The compensation ratio is defined as the relationship of current salaries to the midpoints of the salary ranges. You may be more familiar with the term "compa ratio." Tracking individual salaries in comparison to midpoint allows managers to consider if employees are being paid appropriately on the basis of their skills, experience, and performance. In order to measure the effectiveness and efficiency of the recruiting function, many employers calculate the cost per hire. Cost per hire is calculated by adding up all of the expenses associated with recruiting and then dividing that amount by the number of new hires during the period. Employer contributions to benefit plans have risen at an astronomical rate, and companies are continually monitoring this expense and looking for ways to keep these costs down while still providing employees with healthcare insurance and other benefits. This worksheet calculates and tracks monthly and full-year benefits expense ratios based on data you input. Total compensation is defined as all costs associated with employment, including salaries, overtime, benefits, and bonuses. 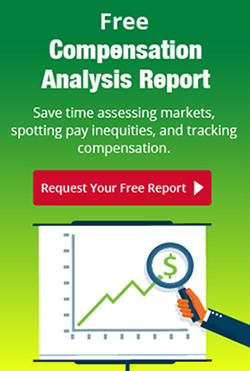 Tracking total compensation as a percent of total costs provides managers with valuable information for use in managing the costs associated with human capital, including evaluating the use of fixed versus variable compensation. This worksheet calculates and tracks monthly and full-year expense ratios based on data you input. The BLR FMLA Time Tracker is as simple to use as checkbook register. When an employee begins his or her first FMLA leave, you enter the amount of leave hours available. As leave time is taken by the employee you record the hours used and the Time Tracker calculates the number of hours remaining. This worksheet can be used to calculate total labor costs per employee by month and full year, and also for a 10-year period. Paying for performance requires employers to carefully evaluate the job performance of individual employees and then to differentiate between annual merit increases based on that evaluation. This calculator is a tool to help you create Merit Increase Guidelines for your company to use in budgeting salary increases that distinguishes between high and low performers. The calculator uses a four-tier performance rating system. Paying for performance requires employers to carefully evaluate the job performance of individual employees and then to differentiate between annual merit increases based on that evaluation. This calculator is a tool to help you create Merit Increase Guidelines for your company to use in budgeting salary increases that distinguishes between high and low performers. The calculator uses a five-tier performance rating system. Makes calculating the pay for an employee whose pay rate changed in the middle of a pay period a snap. Just enter dates and pay rates to get the correct total pay for any given pay period. This confidential form should be the basis for a meaningful, two-way discussion with the employee. The ensuing performance discussion can be most successful when the report is thoughtfully and accurately completed. This calculator can be used to calculate pretax profit per employee by month and for the full year, and also to calculate the pretax profit per employee for a 10-year period. This calculator can be used to calculate revenue per employee by month and for the full year, and also to calculate the revenue per employee for a 10-year period. This worksheet can be used by employees and employers to keep track of the days they take off for vacation, sick time, and personal days. Just input the annual number of days for which the employee is eligible in each category at the beginning of each year, then update the worksheet monthly to reflect days taken. The worksheet calculates total days taken on a year-to-date basis, days remaining in the "bank," and flags employees when they have taken more than their allotment. This calculator allows you to enter current salary information for employees and forecast the annual merit increase and any promotional increases anticipated during the budget year. The spreadsheet will then calculate the total salary and benefits expense for the budget. In addition, the calculator provides you with detailed information to use as a resource when managing these expenses throughout the year. The HR staff ratio and operating expense ratio are two commonly used metrics designed to measure the effectiveness of the human resources department. This worksheet will provide you with a report, based on your input, showing monthly and annual ratios. Calculating the cost of turnover will help the company and individual managers understand the cost of losing and replacing key employees. This worksheet will calculate the cost of turnover for a single vacancy. Tracking turnover can help to identify trends that provide an early indication of potential problems in compensation, management practices, workload, etc. This provides the HR professional with valuable information that can be used to address issues before key employees leave the organization. This worksheet will calculate monthly, quarterly, and annual turnover rates. Turnover is an important metric for human resource professionals. Tracking turnover helps provides information that can be used to address issues before key employees leave the organization. Tracking turnover can help you identify trends that provide an early indication of problems in compensation, management, workload, etc. This provides the HR professional with valuable information that can be used to address issues before key employees are gone. This worksheet will calculate monthly, quarterly and annual turnover rates for organizations with multiple locations. This worksheet will calculate the annual turnover rate for employees during their first year of employment. Voluntary terminations are employees who left the company by choice, while involuntary terminations are employees who were asked to leave because of poor performance, misconduct, or job elimination. This worksheet will calculate the annual turnover rate for employees whose performance is above average. Voluntary terminations are employees who left the company by choice, while involuntary terminations are employees who were asked to leave because of poor performance, misconduct, or job elimination. This worksheet can be used by employees to keep track of the hours they work each day. In addition, this worksheet gives employees the ability to track leave or sick time used each day and calculates an estimate of the employee's gross pay (wages before taxes and other deductions each week).